SOUTH Africa yesterday distanced itself from threats by Democratic Alliance (DA) leader Mr Mmusi Maimane to compile a human rights abuse dossier against President Mnangagwa’s administration following MDC-Alliance-instigated violent demonstrations that saw lives lost and property worth millions of dollars destroyed. The DA, a white-dominated South African opposition party, is a long-time opponent of Zimbabwe. At home, DA is the biggest rival to the governing ANC, a liberation movement with strong ties to Zanu-PF. It also emerged yesterday that DA had forged an alliance with a clique of former members of Zanu-PF known as G40. The reactionary G40 faction comprised of young, corrupt and power-hungry politicians that rallied around former First Lady, Mrs Grace Mugabe. Self-exiled former Higher and Tertiary Education, Science and Technology Development Minister Professor Jonathan Moyo was widely seen as the mastermind of the faction. 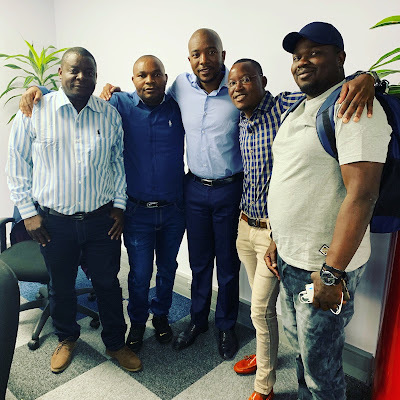 Yesterday, pictures of a meeting of DA and former legislators, Shadreck Mashayamombe and Jappy Jaboon, former chairman of the Children of War Veterans Association Munyaradzi Shoko, among others, circulated on social media. In a Facebook post, Mr Shoko said his delegation had discussed bilateral relations with the DA president. “Today as the founding chairman of COZWA, I had the privilege to meet the DA president as we discussed bilateral relations and African youths in leadership,” he said. The DA, MDC-Alliance and G40 combination points to the formation of a triad of reactionary forces that could pose a threat to the stability of Zimbabwe, South Africa and beyond. In an interview with The Herald after paying a courtesy call on Vice President Constantino Chiwenga yesterday in Harare, South Africa’s ambassador to Zimbabwe Mr Mphakama Mbete said they were shocked by Mr Maimane’s ICC remarks. Instead, he said, South African Government was focusing on butressing relations with Zimbabwe. “We do not agree with what Honourable Maimane has been saying. We are very focused and we are clear about where we want to take the relationship between South Africa and Zimbabwe,” he said. Ambassador Mbete said Mr Maimane must stay out of Zimbabwe’s politics. “He does not have the authority to interfere with the politics in other country. We are clear about that, as the ruling party, they do not have. We are actually surprised with such articulations,” said Ambassador Mbete. He said South Africa and Zimbabwe were working on further cementing their relations. “Our relationship with Zimbabwe is straightforward. It is handled bilaterally between Zimbabwe and South Africa. It is also handled at SADC level. There is a very long standing framework of cooperation between the two countries and nobody can change that overnight,” added Ambassador Mbete. Analysts blasted the new axis of opposition. Political analysts Goodwine Mureriwa said the DA represented white colonial interests and was bent on stalling land reform in South Africa. “The DA is a remnant of apartheid. They represent white colonial interests. In their naivety they think they can undermine Zimbabwe’s land reform to stall inevitable land reform in SA,” he said. He also slammed the DA for thinking they can subject Zimbabwe to the International Criminal Court. “Zim is not part of ICC. We do not subject ourselves to imperialism, neither do accept Western sponsored international law and its dictates. “Our land reform is irreversible. Zimbabwe’s sovereignty is sacrosanct and non-interference in the internal affairs of other countries, regionally and internationally, is the basis of our foreign policy,” Mr Mureriwa said. Another analyst, Mr Gabriel Chaibva echoed similar sentiments saying it was ironic that they were now celebrating fugitives as champions of the fight for democracy. “We should just forget about the DA and Mmusi Maimane. Who doesn’t know that they represent white interests and are remnants of Apartheid?